Georgetown University's School of Continuing Studies does not require GRE or GMAT test scores for admission to our graduate programs. Note: The EMPS programs and the MPS in Systems Engineering Management only admit students for the fall semester. Our application is conveniently located online for you to complete at your own pace. There is a $50, non-refundable fee. Submit an up-to-date resume or CV; this should be no longer than two pages. What are the specific academic and professional qualities you possess that could help you excel within this program? What goals do you hope to achieve if you are accepted into this program? Through the online application portal, you will be prompted to provide the contact information for two recommenders. They will then receive an electronic request with instructions for submitting a recommendation through the application portal. The email will be sent immediately upon saving your application. Recommendations should be completed by supervisors who can attest to your professional abilities. Recommendations from former professors are acceptable for applicants with limited professional experience. Recommenders can submit their letters before you submit your application. Official transcripts are required from all undergraduate institutions where 16 or more credits were earned. Official transcripts are required from all graduate institutions where any credit was earned. These transcripts should be sent to Georgetown SCS Admissions Office. Transcripts should either be sent in an envelope sealed by the school's registrar, or via an official online transcript provider to scsadmissions@georgetown.edu. 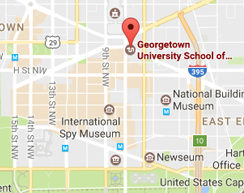 If your transcript is sent to another school at Georgetown University by mistake, you will need to reorder the transcript and have it sent to the School of Continuing Studies. Transcripts sent to another school cannot be retrieved. If you have already completed your bachelor's degree, your transcript must state your degree and degree conferral date to be considered official. If you are currently completing an undergraduate degree, you are only eligible to apply for the fall term. The Office of Admissions must receive your transcript, with a bachelors degree conferred, prior to the start of classes in order for you to be granted full admission status. All U.S. institutions must be accredited through one of the bodies officially recognized by the U.S. Department of Education. If you require visa support through Georgetown, you must provide proof of degree conferral in order to be considered for admission to our programs. We cannot conditionally review international applications, unless they are graduating from a US institution. Official transcripts from all undergraduate and graduate institutions outside of the United States, where credit has been earned, should be evaluated by WES or ECE. Applicants should request the course-by-course evaluation. It is not necessary to send additional copies of your official transcripts. Applicants must demonstrate that they have successfully completed a degree equivalent to a U.S. bachelor's degree before they may be considered for admission to a master's program. Please be advised Georgetown SCS will not review graduate applications while a bachelor's degree is in progress at a higher education institution outside the U.S. Applicants applying to a master's program should complete the degree before obtaining a WES or ECE evaluation. For application consideration for the fall term, we must receive a WES or ECE evaluation showing degree conferral by May 1. Writing samples can include published or unpublished works. Applicants can also submit links to video, photography, or other creative work that is relevant to your degree program. See below for program-specific details. Design Management & Communications: Samples can include creative strategies, digital design elements or images of physical design elements, social media campaigns, or marketing communications plans. Integrated Marketing Communications: Writing samples can include consumer research, marketing communications plans, or creative strategies. Journalism: Writing samples can include blog posts, essays, or articles. Public Relations & Corporate Communications: Writing samples can include press releases, communication plans, or opinion editorials. Option 1: Write an essay using a book of your choice. It should be about five pages in length, typed and double-spaced. It should describe the author's central argument, proposal, or theme. Be sure to describe how this is developed in the book, as well as any conclusions you may have reached. Option 2: Submit an academic paper from a previous graduate or undergraduate course of at least seven and no more than ten pages in length. Make sure your name and the course title is included on each page. Option 3: Submit a published writing sample, such as a journal article. Graduate coursework at Georgetown University is reading- and writing-intensive and requires proficiency in written and spoken English. Students should plan well in advance to complete the necessary tests and allow time for the Georgetown SCS Office of Admissions (institution code 5986) to receive the results. There are additional requirements for international applicants.